The latest offerings from the merchandiser includes goodies for Behind the Mask: The Rise of Leslie Vernon and Big Trouble in Little China. 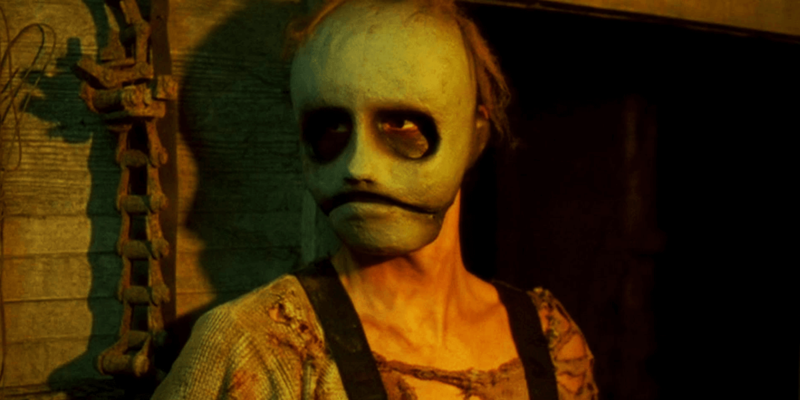 One of the biggest surprise horror hits of the last 20 years, in my opinion, was Behind the Mask: The Rise of Leslie Vernon. To this day, fans continue to hope for good news regarding its long-awaited sequel. 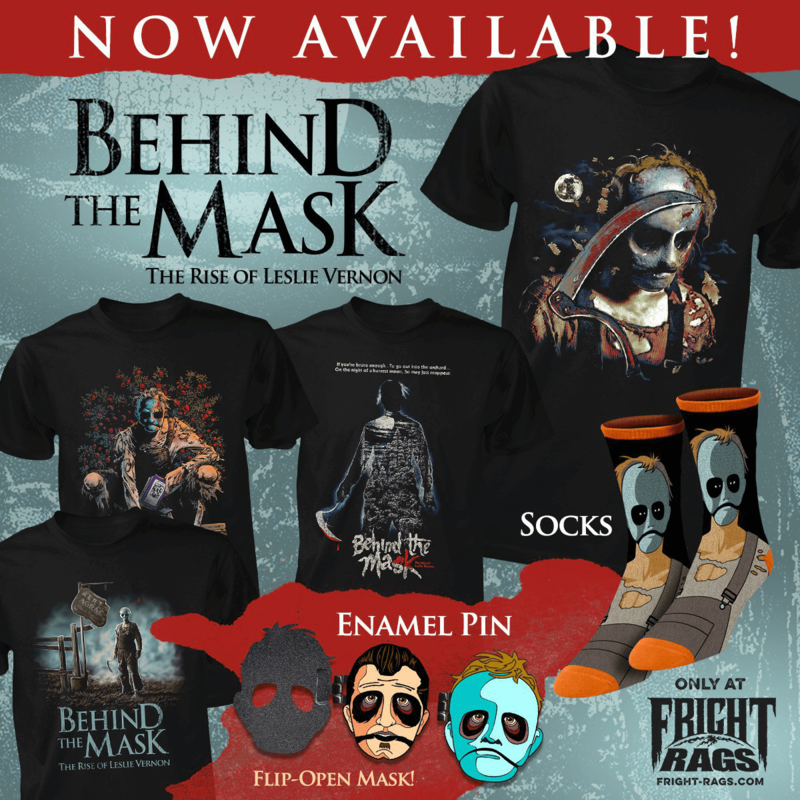 While we don’t have any sequel news for you this time, you can still show your support for this much-beloved film by stopping by Fright-Rags to check out the shop's new collection for the film. Four brand new shirt designs (one in particular is a stunning homage to Friday the 13th), an enamel pin, and socks (of course) round out this new collection. Every month, you can always count on Fright-Rags to release something that is made with the sole intent of making your wallet lighter. This collection can be bought now over on the Fright-Rags website. Looking for something a bit more classic? 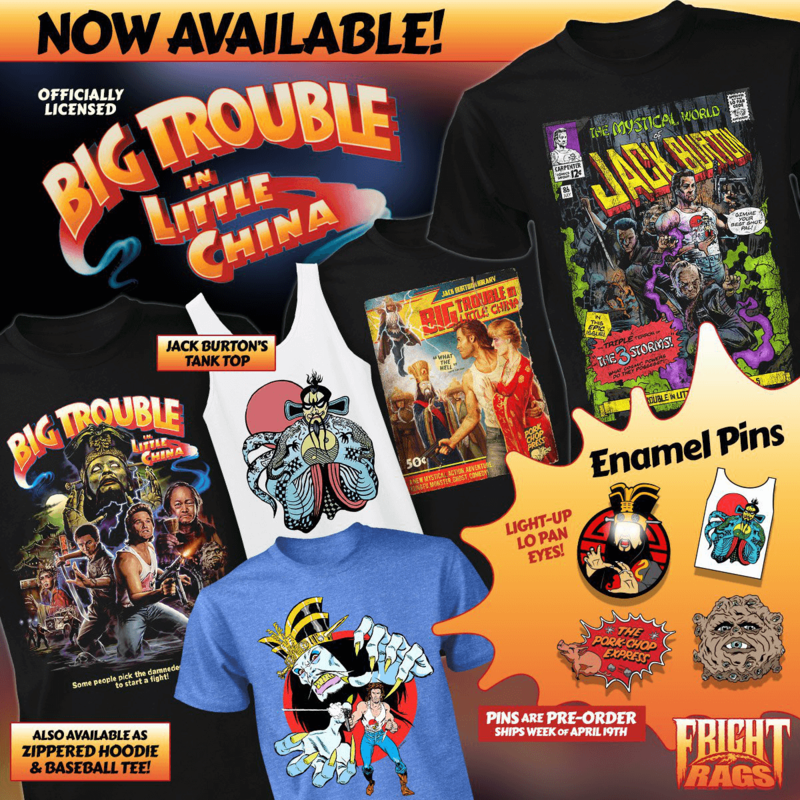 Fright-Rags has you covered for that as well with their new Big Trouble in Little China collection, which is honestly stacked. Starting off with a replica Jack Burton tanktop design that, let’s face it, every male who has ever watched this movie wanted. Four other new designs are also offered, with one being offered as a baseball tee or zippered hoodie. Don’t worry, enamel pin fanatics, there is plenty for you as well. Four pins are available, with the Lo Pan pin having light up eyes. Oh, and this collection is available right now as well, so hop on the ole Pork Chop Express and pick yourself up some choice Jack Burton swag. You know you want to. 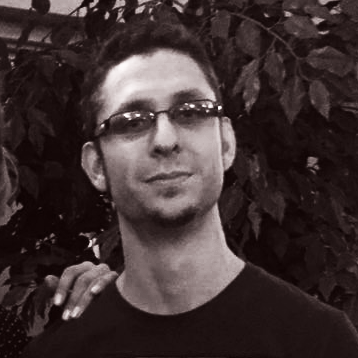 Be sure to keep your eyes peeled on Dead Entertainment for more awesome horror merchandise.